The rest of the speech continued in much the same way, striking a very conciliatory tone. For his part, Chinese Minister for Commerce Gao Hucheng said that the talks had been “positive”. 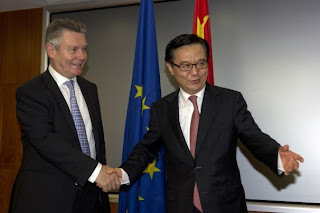 This all helped raise hopes that a deal could be reached ahead of the August deadline meaning the EU tariffs on solar panels could be (largely) avoided and Chinese retaliatory tariffs on wine would never be more than an empty threat. We’re not sure that will provide much comfort to France and other countries which fear the imposition of tariffs. Needless to say then, it seems whatever talks have been going on behind the scenes have not been fruitful. This spat looks set to escalate, not least because the WTO is likely to turn into a battleground with two of the largest economies trading blows and trying to garner support. With the August deadline just over a month away hopes for an “amicable solution” look to be fading.